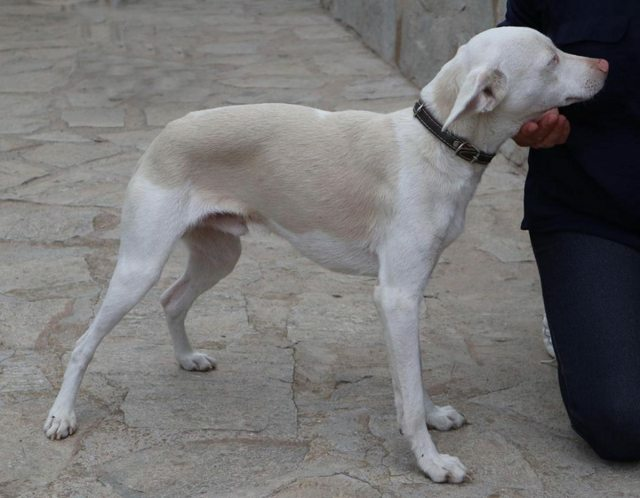 Ice is a 10 month old male Ibizan Hound (Podenco) Cross. This is stunning Ice, the cute white puppy with beautiful blue eyes! 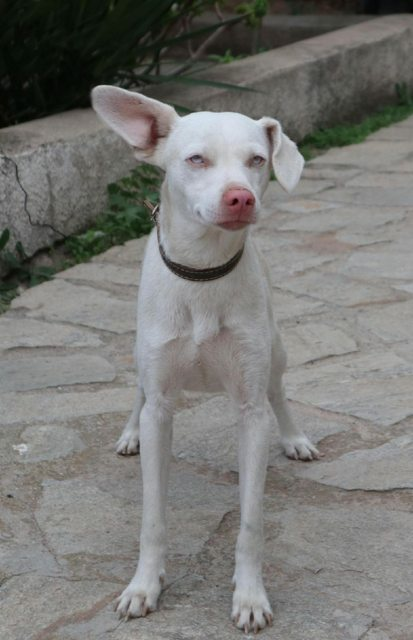 He has a short white silky coat and he will be a medium sized dog weighing now 10 kg and height at shoulder 42 cm. Ice is very lovely and affectionate. Now he is absolutely healthy, happy and lively! He loves his walks and getting much better on his lead Good in the car, good in the vet, no problem. Not tried with small children or cats but we can try to test for cats if required. Every month treated with Advantix , and protected with Scalibor too. Ice was found with his sibling SWEET. He must walk on a leash, because he still doesn’t respond to the recall. Ice is a good boy, enough independent and not scared, clean in the home ( he was in my home immediately after the neutering); good with other dogs, but with character, he is a leader! 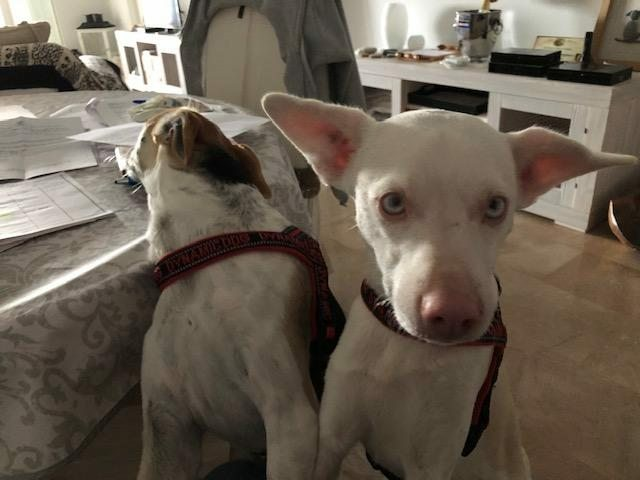 Current occasion is in a foster home in Spain can travel to the UK once he has a home to go to, Vaccinated, wormed, flea treated, Neutered, Microchipped, Pet Passport, FREE 4 weeks Pet Insurance to be activated from the link on our website, Any known health issues NONE KNOWN. 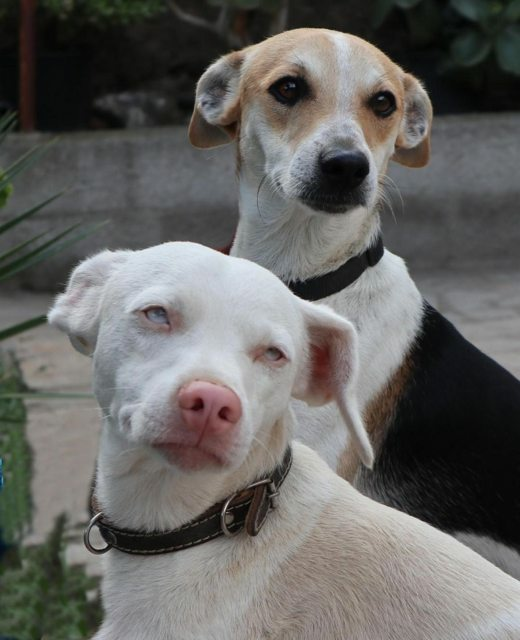 FOR DOGS COMING FROM OVERSEAS: This adoption fee is a contribution towards the costs of rescuing the dog- microchip, passport, vaccines, tests for S European diseases, neutering (IF OLD ENOUGH), parasite treatment and transport to the UK.